The Amsterdam Light Festival is an event that takes place during the holiday season every year in the Netherlands capital. This year marks its 7th anniversary of brightening up the dark days brought by the winter with the event taking place on 29 November 2018 until 20 January 2019. It is an event that many people both local and international look forward to as it is an unforgettable experience and known as one of the largest light art festivals in Europe. Keep reading for all the best advice on all things regarding the Amsterdam Light Fetival including dates, times and unique ways to view the light installations. What Is the Amsterdam Light Festival? 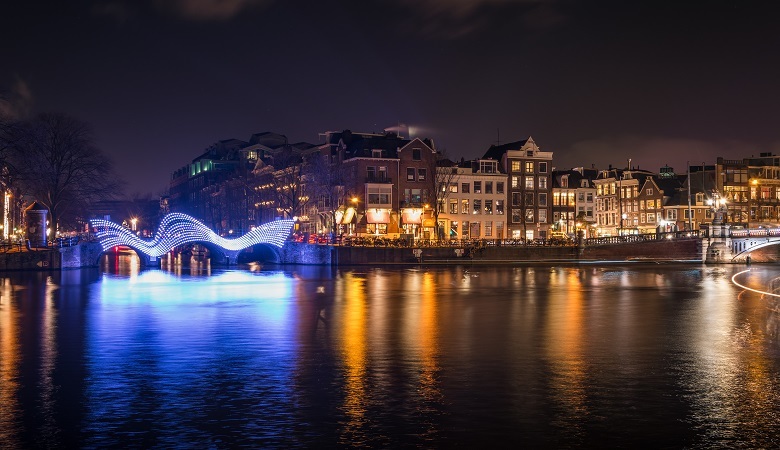 The Amsterdam Light Festival, as its name suggests comprises of light installations and sculptures that are designed by both Dutch and international artists and architects. Out of hundreds of worldwide submissions, only around 30 are selected by a committee to be displayed in the city. The installations are then positioned around the public spaces of Amsterdam for the entire duration of the festival. How Can I View the Light Installations? There are 2 main unique ways to view the light installations, the Water Colors boat route and the Illuminade land route. The Water Colors boat route lets you tour the light art through the canal from the comfort of a boat cruise. The are different types of boats that you can choose from with their own special offerings such as heated boats, toilets on board, blankets, and various catering options. This route is ideal if you have children and you want to escape the winter cold. There is also an option on some boats to choose from multiple languages including Dutch, English, and German. Tickets for this range from €20 to €150 for luxury boat rides. It is also advised to pick an official canal tour partner of the Amsterdam Light Festival as they are guaranteed to give you the best views of the installations. The second route is the Illuminade land route, if you prefer to stroll around and view the installations at your own pace then this path is paved out for you. Amsterdam is packed with restaurants from all over the world if you’re looking for a quick snack or a filling meal. Food stalls can also be found parked in various locations of this beautiful city if you prefer to have a bite on the go. Considering the festival takes place until January, you and your family can enjoy a walk around the city after Christmas to walk off all the holiday feasting. Guided walks range from €10 to €20, making it a cheaper option, even though you can choose to do the walk on your own for free. The ultimate Dutch way to experience the installations is perhaps through renting a bike for a bike tour which roughly costs €10 and takes place for approximately 2 hours. If you are wondering what time the event starts, then the boat tours run on a specific time schedule from 17.00 to 23.00 with the latest boat departing at 21.40. The Iluminade route guided walks take place from 17.00 to 22.00 however, if you decide to walk on your own then the time is completely dependent on you! Our top tip is to always make sure you dress warmly so that you can comfortably enjoy the exhibitions without worrying too much about the cold, as it is indeed winter. The city of Amsterdam has a lot to offer in terms of culture, art and history. One place that will never leave you bored as there is always something to do. The city is almost always full of tourists which contributes to the easy-going culture that it is known for. As you walk through the city you are guaranteed to hear multiple languages due to the diverse population of the town. It is also perfect if you want to tour some major attractions but do not want to walk very far as a lot of them are located in the centre. If you want to know Amsterdam a little bit more then have a look at our ‘Visit Amsterdam’ blog for top tips on how to get around, and other things to see and do in Amsterdam. As with every work of art, there is a great amount of effort that went behind it. If you are curious about the makers of these beautiful light sculptures, then you can read their personal stories here. a nomad with a passion for poetry! Looking for inspiration for your next short break in Europe? We are dedicated to providing our readers with the latest travel trends, top destination tips and best deals for their next getaway. Whether you’ve got your sights on a family-friendly resort in Holland or a campsite in the South of France, the HolidayParkSpecials travel blog is the go-to guide for inspiration!